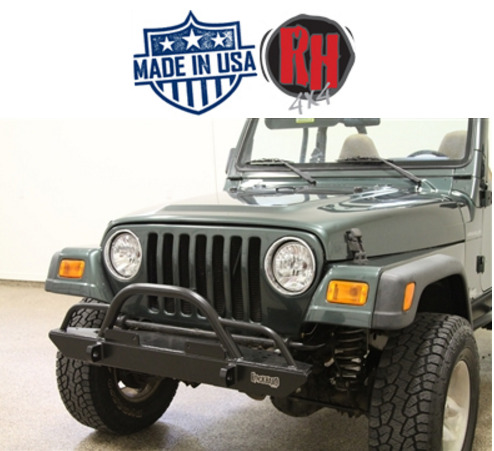 Rock Hard Jeep Front Bumpers are designed for heavy duty use in the rocks. made of 3/16" x 2" x 4" tubing and come with an integrated CNC laser cut winch plate, roller fairlead mount and holes for lights at outer edge of winch plate. This bumper also comes with an straight up hoop & extensions for the rock crawler look, 2-5/8" x 2 1/2" CNC D-Ring shackle mounts welded front and back for ultimate strength and a mounting plate for a steering box protector.